At least twice a day millions race underground to these stylish bunkers where they pack themselves into these equally stylish pods in a manner befitting a tinned sardine. No eye contact, please don't talk. Best of all please don't expect to get anywhere on time. Weekends. I suggest you walk. Can you spot where the millions in refurbishment has been spent? Yes, I can see that the tunnel is showing its age ... but the light came up well in your camera! I also like the movement that you show in this closest end of the train/pod. Was that something called "rear curtain". I was told about it but don't think I am up to using it yet. My goddaughter loved those sardine cans. We could have travelled all day on the tube and she would have been happy. Showing my age when I say I can remember 'racing' to the 'bunker' at Maida Vale when shrapnel was raining from the sky. I think I learned on my 3rd or 4th trip to London that walking was sometimes faster than riding the tube. I do love them though. I can't tell what refurbishing was done unless it is the CCTV cameras. ZOOOOM! 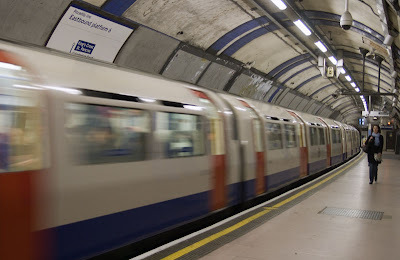 I rode the subway in June on my way from Heathrow to Euston station. Fun as we don't have subway in Minnesota! It still beats having no system which is what we have. Our world... fast paced, slow paced. We get around. Nice shot. what used to get me about the London tube system whenever I went there was the long undergound walks between some of the platforms. In Göteborg there is no tube system only trams and buses. And it is the sea you see in my photo from last week, actually Sunday just after my bath. Love the movement in the photo. You have a great touch. I'm guessing the money went for cameras and lights. Very tube-like! I never thought of sardines as role models but maybe they're on to something. I suppose it is something like the future for lots of people as you never know what the weather is going to be like or who will rob at the next stop. I wouldn't like it but then I am old fashioned beyond belief. I still prefer the old horse and buggy to cars and asphalt highways and covered bridges to structures like the Golden Gate. Amir seems to be doing fine although he is not posting much. Thanks for asking, Mo. Hi Mo, this is a great action photo, well done! Hi, Mo. Another great blog. I LOVE the London underground. Even the smell of it. Yes, I know I'm a bit odd. As for not speaking... in my distant single days, I distinctly remember chatting up a young lady on the tube with nary a rebuke. Oh, but once I accidently (honest, it really was a mistake) cut into a queue I didn't see waiting on a bus on Trafalgar Square and was soundly (verbally) thrashed by an old lady in the queue ahead of me. So they are not always silent. Where have they spent the Millions? That is a mystery that may never be solved. As much as the tube system needs to be upgraded, when the Jubilee line shuts down virtually every weekend it doubles my journey time into central London. «Louis» looks forward to seeing the next installment in this series! You are spot on with the comments especailly the no eye contact. Excellent image, perfectly captured. I admit, I do feel like a sardine on a tube train, but guess what? Last time I was in London, someone gave up her seat for me! She must have seen me struggling to stand, with my recently repaired rotator cuff, and the other one torn too. Bless her. She hardly waited to be thanked either, but swapped places with me with a smile.